"The Honeydripper"/"Baby, Are You Kiddin'?" Above: Photo of The Delta Rhythm Boys. 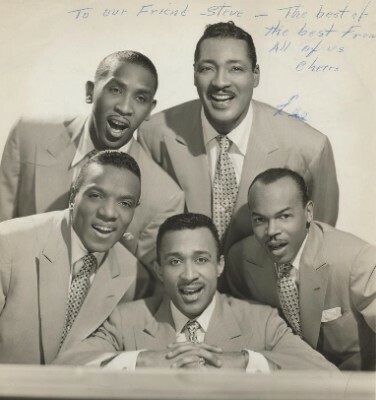 (Back L-R) C. Holland, Lee Gaines, (Front L-R) Traverse Crawford, Rene DeKnight (piano), Carl Jones. Click HERE for a short article about The Delta Rhythm Boys by J.C. Marion. Above: Photo of Jimmie Lunceford Orchestra. Lunceford studied music at Fisk University and City College in New York City and then taught music in Memphis. In 1935, after several "hot" recordings, he achieved a national reputation as an outstanding black swing band. In the early 1940s, his orchestra released several vocal group harmony recordings featuring The Lunceford Quartet. 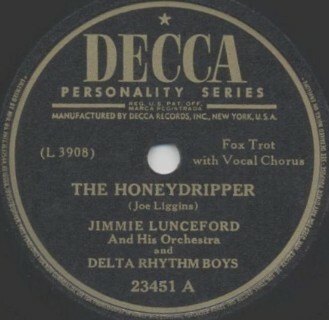 Above: Label for Decca 23451 A ("The Honeydripper"), both sides recorded on August 9, 1945 and released in September 1945. This was a cover of Joe Liggins' big hit released earlier in 1945. Blues singer Roosevelt Sykes (who was aka "The Honey Dripper" as early as 1937) also scored a hit with this tune in 1945. A) Click on an option below to listen to Jimmie Lunceford Orchestra And Delta Rhythm Boys using Streaming RealAudio. B) Click on an option below to listen using Downloading RealAudio.